At first the movement felt like the swaying of a rocking chair and participants relaxed. But bodies stiffened to absorb the movement when the rocking became harder, more jolted as the simulated earthquake intensified from a 3.0 to a 5.0. When the Indiana Geological Survey's Earthquake Cottage jolted into 20-seconds of a 7.0 earthquake, participants' hands grasped their seats or nearby handles while their feet attempted to brace against the mechanical bull bucking-like intensity. "I was holding on, otherwise it would have thrown me into the cabinet," said Bryce Nord, a junior business marketing major from Ferdinand. "If I wasn't in a seat, I'd have been rolling on the floor," said Michael Furnas, an Indiana State University senior environmental health major from Terre Haute. They were among the students and Terre Haute residents who experienced the Earthquake Cottage, which visited Indiana State at the request of the university's earth and environmental systems department and the Osher Lifelong Learning Institute. "We have a history here in the Midwest of having earthquakes, with some of them being fairly significant," said Anthony Rathburn, Indiana State geology professor. "We brought the simulator here on campus to allow students to experience an earthquake in controlled conditions and also to learn more about what they can do to be prepared for earthquakes that will happen here in the Midwest again at some point." Since 1817, Indiana has experienced 43 earthquakes between a 3.0 and 4.9, including one in May with an epicenter north of Vincennes that moved the Wabash Valley, said Walter Gray, educational outreach coordinator for the geological survey. Gray also cited research by Indiana University professors Pat and Cheryl Munson, who reported that at least four times in the past 12,000 years earthquakes of 6.0 to at least 7.0 have rattled the Wabash Valley. 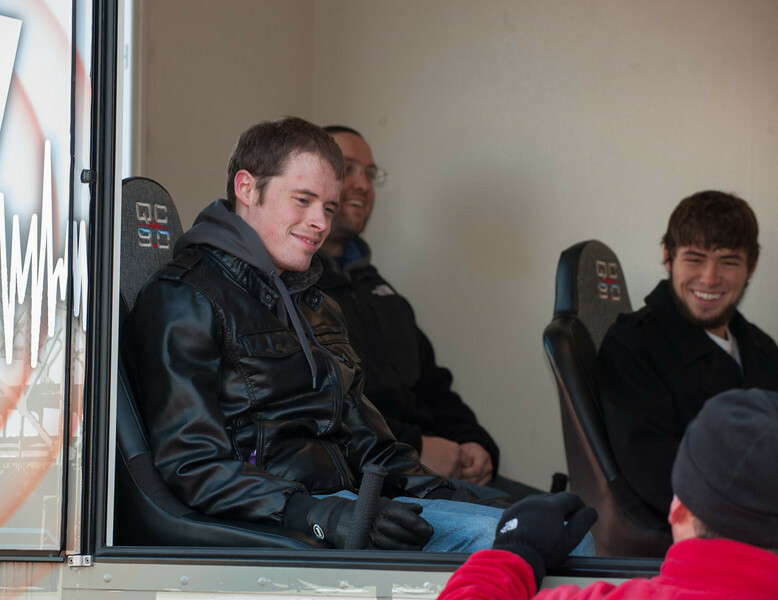 As Gray ran the simulator, he spoke to the participants, teaching them about how to respond if the ground started to move. "Pictures and mirrors can fall off the walls," he said. 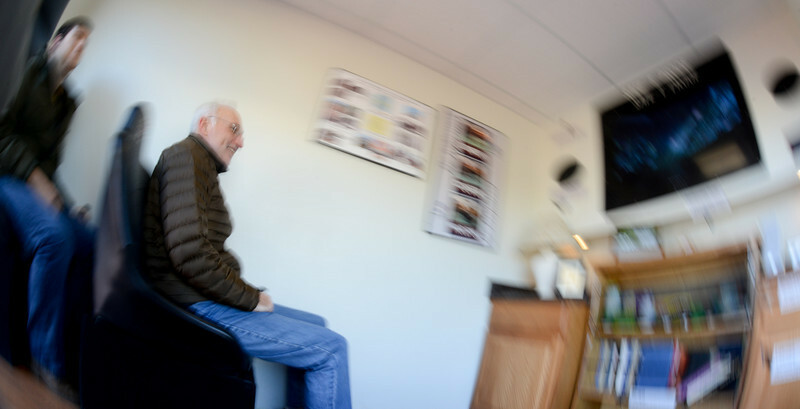 "If you're in a room with ceiling tiles, those will start to come down at this point as well. This is how most people get hurt in Midwestern earthquakes, by falling objects, which is why we ask you to drop, cover and hold on instead of dropping to the floor and just slightly covering your head and neck." People should secure pictures, bookcases and other objects to walls, keep emergency preparedness kits and know how to turn off their water, gas and electricity, Gray said. Michelle Bennett, OLLI program administrator, said they wanted to use the simulator for educational purposes. "Most of us have lived in the Midwest all of our lives and have never experienced a major earthquake. We all have to be prepared so not to have as much damage or injuries," she said. "Eventually we'll have a bigger earthquake and I want my people to be prepared and to have a little more knowledge." Indiana has several faults, known as the Wabash Valley Fault System, that lie buried deep below the surface in the southwestern corner of the state. "It's like having a nice fudge brownie and when you tear it apart it, the break in the brownie is a series of cracks, not a single line like it would be if you sliced it," Rathburn said. "The earth's crust behaves in a similar manner. Cracks in rocks where there is movement on either side of the fracture are known as 'faults.' Like the cracks in a brownie, faults can move and behave independently from one another and they respond to stress." That response can lead to the build up and eventual release of energy that can shake the surface of the earth. A seismic station in Indiana State's science building shows that the Wabash Valley experiences earthquake seismic activity almost continuously, usually much below than the 3.0 that humans can feel. "It is inevitable that we are going to get more earthquakes," Rathburn said. "Earthquakes are in our future. The Midwest is second only to the west coast in terms of earthquake danger in the United States. We really need to be better prepared than we are." 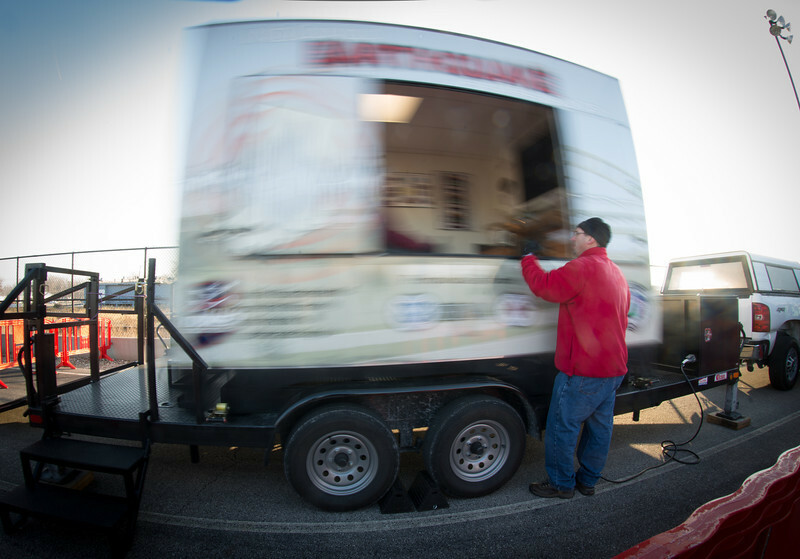 Students and community members experienced earthquakes at intensities of 3.0, 5.0 and 7.0 when the Indiana Geological Survey's Earthquake Cottage visited campus.